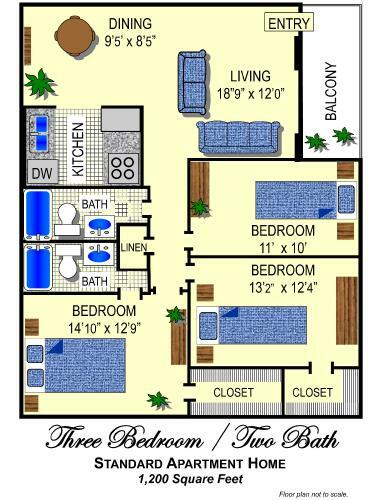 This three bedroom and two full bathroom apartment has a living room and a separate dining room. The apartment has a dishwasher, central air conditioning and ceiling fans. There is a laundry room off the kitchen which has washer and dryer hookups. In the middle and master bedroom there is a huge walk in closet for plenty of storage. The second full bathroom is located in the master bedoom. Each apartment either has a long balcony or a fenced in patio.